As is so often the case, horrifying events overtake us as we are in the process of planning our campaigns. While Red Card Israeli Racism was setting up an international petition (see below) to support Palestinian calls for the Israeli FA to be suspended from FIFA, two young Palestinian players were badly injured by the Israeli military. At the same time play had to be suspended at the Faisal al-Husseini stadium because of tear gas fired by the same Israeli forces. The Red Card campaign is developing a long-term strategy targeting Israel’s membership of international football bodies, at the Brazil FIFA World Cup, at next year’s UEFA competition (which has Israel playing Wales both at home and away), and beyond. The international petition is intended to serve as a rallying point for this long-term effort. Please add your signature and pass this on by email, FB pages, Twitter etc. 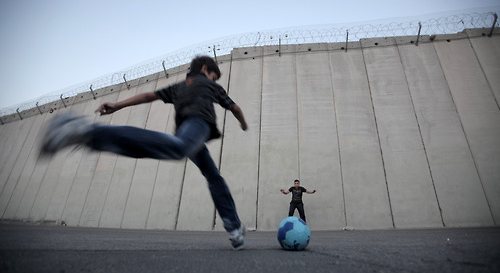 The Red Card campaign drew support for its campaign against Israel hosting the 2012 UEFA under-21 championship from figures as diverse as filmmaker Ken Loach, Nobel peace laureate Desmond Tutu and footballing legend Eric Cantona. 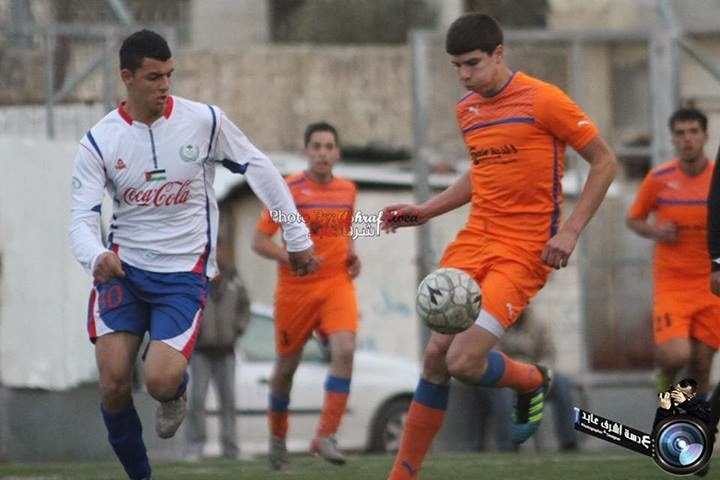 Its new petition says Israeli state policies, implemented by its civil and military forces, deny Palestinians the right to play and compete, nationally and internationally. “It is now time for sports initiatives to add their voice…. [to] commercial and cultural actions worldwide … demanding an end to Israel’s repressive policies,” says the petition text. Chairman of the Palestinian Football Association Jibril al-Rajoub cited the incident as evidence of Israel’s unsuitability for membership of FIFA. He has repeatedly threatened to call on the FIFA annual congress in Brazil in June to suspend the IFA. Since 1967, Israel has maintained a brutal military occupation of Palestine, building illegal settlements and a separation wall on stolen land, despite condemnation by the UN and International Court of Justice. Within Israel, over fifty laws discriminate against its Palestinian citizens. When influential sports organizations say nothing in the face of an injustice of such magnitude they are complicit. Commercial and cultural actions worldwide are increasingly demanding an end to Israel’s repressive policies. It is now time for sports initiatives to add their voice. There is blatant well documented racism within Israeli football. ** Players of Palestinian origin suffer insults from the terraces: Beitar Jerusalem football club is arguably worse than any in Europe with chants of ‘Death to Arabs’ and arson attacks. Any efforts made by the Israeli FA to stop this abuse have been ineffective. In 2013 footballers like Eric Cantona, Frederic Kanoute and 50 other international players challenged UEFA’s decision to hold the Men’s U-21 tournament in Israel. Eminent human rights activists questioned how an organisation that clearly promotes anti-racism can place a major competition in an openly racist country? Yet UEFA still plans to hold the U-19 Women’s final there in 2015 and may consider Israel as a venue for preliminary matches in Euro 2020. FIFA has recognized some Israeli abuses and created a Task Force aimed at facilitating the movement of players and equipment. But its success depends on the goodwill of the Israeli Defence Force. When FIFA formally suspended the membership of South Africa FA from 1964 until 1992, its action contributed to an end to apartheid. Therefore, this petition asks FIFA to follow this precedent and suspend Israel as it did South Africa until Israel respects the human rights of Palestinians and observes international law. The Israeli government must at some point take notice.